Being able to save money when grocery shopping has been a goal for our family in 2018. I love food and I can easily spend lots of money on food. I have been working really hard this year to try to cut down on food purchasing. I wanted to talk about ways to cut down on your food budget and still have healthy and delicious food options available. Cook more at home. When it comes to actually cutting down food costs, limiting your eating at restaurants will help. When you eat out, you spend a lot more money. If you are feeding a whole family that can easily add up. Then if you aren't spending a lot (going to a fast food restaurant, you are trading money for high sodium and low nutrient containing food items). Working hard to plan meals to be prepared and eaten at home will go such a long way in saving you money with your food budget. Plan meals out ahead of time. Being able to eat meals at home requires planning. You obviously can't cook food at home, if you don't have recipes already picked out and food purchased. Sitting down for even 30 minutes a week, picking out a few recipes and writing out what ingredients you need for those foods items will go such a long way in helping you stick with your budget. When you know what food you need to purchase to cook at home, that will help with the next recommendation - creating a list. Stick to the shopping list. To help you save money, write out your shopping list. 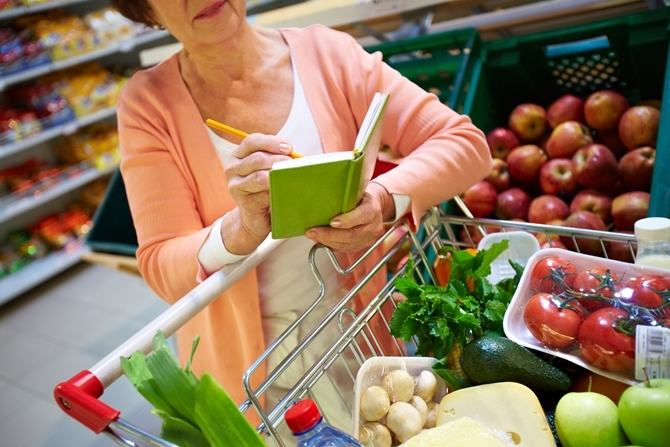 When you have a list and you go to the grocery store, sticking with your list will help save money. Lots of time that extraneous spending happens when you decide you "need" things from the store, that aren't on your plan. That shopping is to serve as a guide when you head to the store. Stick with purchasing only what you need and that will help save lots of dollars. Shop the sales or cheaper stores. If you are able to look through ads and shop the sales, that is a great way to save money. If that takes too much time and you aren't able to run to multiple stores, then try to find the best deals on the store you shop at. I am a huge believer in Aldi. I really like that store and I get all of my staples from Aldi. I am able to spend <$100 most weeks on food because I purchase all my produce, milk, cheese, eggs and most meat items from Aldi. I don't have the time to shop sales at multiple stores. Find what works best for you and your schedule. Use left-overs. If you take time to cook a meal and you have left-overs, use those for another meal or to take with you to work. That is a huge cost saving measure. Most of the nights when my husband isn't able to come home for dinner, we eat left overs. I will also pack left overs for lunches the following day. That is an easy way to efficiently use that meal you spent money and time on to prepare.